CBS News Investigative Unit's Kim Lengle wrote this story for CBSNews.com. Ads hyping high fructose corn syrup (HFCS) for its similarities to sugar are hitting the airwaves - part of a major marketing campaign from the Corn Refiners Association meant to combat the bad rap that HFCS has gotten in the past years. The commercials feature products containing HFCS - a mother pouring a jug of juice and a woman feeding her boyfriend a popsicle. In both, characters question the health risks of consuming the corn-derived sugar replacement but can't quite articulate what's harmful about it. Critics say it contributes to weight gain and tricks your body into wanting to eat more. And a lot of health-conscious people think it's a toxic chemical concoction that can't be good for you. But the industry says it's just fine. In fact, they make an interesting argument - HFCS is the same as sugar. Much of the debate surrounding HFCS focuses on the difference between old-fashion table sugar and the replacement, which is now common in the majority of processed foods. It prolongs shelf life of food, maintains moisture and is cheaper than sugar. "We want to correct the record," said Audrea Erickson, president of the Corn Refiners Association. "Being led to believe that consuming sugar is better than high fructose corn syrup is not based on fact." To get that message out, the campaign relies on nutritional research. But CBS News has learned that funding for many of the major studies came from companies with a financial stake in the outcome. Of the six studies CBS News looked at on the association's Web site that "Confirm High Fructose Corn Syrup [is] No Different From Sugar," three were sponsored by groups that stand to profit from research that promotes HFCS. Two were never published so their funding sources are unclear. And one was sponsored by a Dutch foundation that represents the interests of the sugar industry. Pepsi funded one study, so did a D.C. based lobbying group that gets their money from food, chemical and drug companies. And the American Beverage Association gave a grant for another. One researcher who was involved in three of the studies, Dr. James M. Rippe, a cardiologist and founder of the Rippe Lifestyle Institute says there is no link between HFCS and obesity and calls contrary evidence "accusations" and "speculation." Rippe's ties with industry are no secret. Pepsico, Tropicana and Quaker among others are all listed as Rippe Health Partners on his Web site along with this quote: "The RLI research team conducts multiple studies of mutual interest to RLI and PepsiCo North America in topics such as short-term energy regulation response to high fructose corn syrup…"
But research indicates the source of a study's funding has a stake in the outcome. Last year, research from the Children's Hospital Boston suggested that nutrition research, like medical and tobacco research, can be influenced when industry funds the studies. It showed that when studies were sponsored exclusively by food/drinks companies, the conclusions were four to eight times more likely to be favorable to the sponsoring company. "I think the honest tag line should be 'It's just as bad as regular sugar,'" said Margot G. Wootan, director of Nutritional Policy at Center for Science in the Public Interest. Wootan says that people shouldn't be afraid of trace amounts of HFCS in their food but that they should be concerned about limiting huge amounts of sugar in their diet. 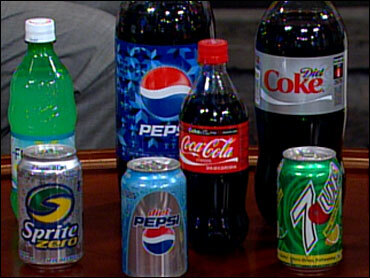 The average American consumed 56 pounds of HFCS in 2007. Soda is the single biggest source of HFCS in the American diet - 17 teaspoons for a 20-ounce bottle, according to a four-year study on soft drink consumption by CSPI. That same study published findings that soft drinks directly contribute to obesity because of its high amount of non-nutritious calories. No other single product has been shown to promote weight gain in the same way, according to its researchers. HFCS is derived from milling corn, processing that starch into syrup and adding enzymes to convert it into fructose. To make the most common form of HFCS, glucose syrup is added to fructose making the composition, 45-percent glucose and 55-percent fructose. Similar studies have also found that appetite, which normally decreases after eating, decreased less after drinking fructose-sweetened beverages. And that it caused triglycerides to increase, an indicator of risk for cardiovascular disease. Rippe's study argues that these findings are invalid because they examine the effects of pure fructose rather than HFCS, which is only partially comprised of fructose. But the researchers who CBS News spoke to said studies showing a link between fructose and obesity suggest a "total effect on the body" when too many sweets are consumed regardless of what form of sugar is used. The Corn Refiners Association released another commercial this week targeted at moms. The association says it's not interested in driving up consumption of HFCS. Erickson wouldn't comment on the cost of the ad campaign but reports estimate that the cost is between $20 to $30 million.